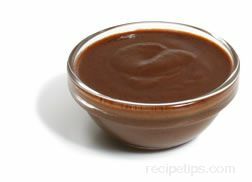 A spicy, rich Mexican Mole sauce, also known as red Mole, which is a mixture of onion, garlic, chile peppers (commonly pasilla and ancho), ground nuts or sesame seeds, toasted bread, spices, sunflower or soybean oils, sugar, and occasionally a small amount of sweet chocolate. It is reddish-brown in color and has a sharp spicy flavor. Red Mole pasate, made from the ingredients, is often mixed with water or a chicken broth (1 part Mole to 3 parts water/broth) before being heated and boiled into a sauce. It is then added as a seasoning to chicken or pork, eggs or egg dishes, enchiladas, rice, refried beans, or tamales. 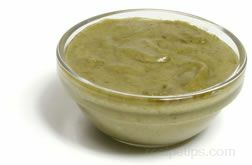 Another variety of this sauce is available as a green Mole or Mole Verde, which is a milder Mexican condiment made with tomatillos and green peppers to be served with a variety of seafood, poultry or pork dishes.